“I wanted to visit Korea to meet Mother and to listen to Her words of blessing directly” (quoted from the interview with an overseas member featured in the May 2012 issue of the Elohist). This past mid-April, the 57th Overseas Visiting Group consisting of over 200 members from North America and Europe visited Korea. 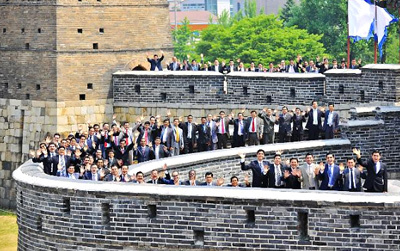 Every year, more than 1,000 members from many different parts of the world visit Korea for the same purpose. We are definitely living in a prophetic age when we see the following prophecy unfolding into reality, “Lift up your eyes and look about you: All assemble and come to you; your sons come from afar, and your daughters are carried on the arm” (Isa 60:4). 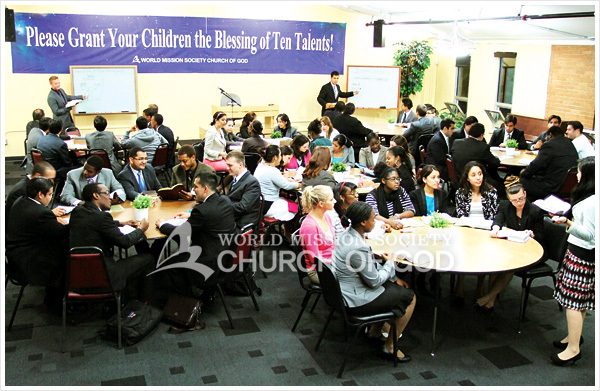 On April 24, when the schedule of the 57th Overseas Visiting Group was about to end, I the reporter met Pastor Lee Hun-jae from the Chicago Church, USA, who was having a busy schedule with the members who were filling themselves with the Holy Spirit every day. He had been playing a significant role in missionary work in the United States for 16 years, as a living witness to the gospel in Chicago. The members of the Chicago Church gather together in the front yard of the Church after celebrating Resurrection Day. _ How many members from Chicago have joined this visiting group? _ You must be filled with emotion when you see how much the gospel in Chicago has progressed, compared to the situation of 10 years ago. “It’s really amazing to see how many souls have now been found all over the world. I am so amazed at the fact that God’s work is being accomplished very quickly but quietly. Until the Chicago Church was established in 1999, there was only one Church of God—the L.A. Church—throughout the U.S., whose land mass is 98 times larger than Korea’s. The New York Church was established not long after the gospel began to be preached in Chicago. The Chicago Church started from a house Church in a small apartment. There were only my wife and me and another couple from Korea. Our beginning was so weak and humble. After a year, we were given a new temple, but since there were not many members yet, the new temple felt even emptier than the house Church. Since God said that the gospel would be preached in Samaria and to the ends of the earth, I believed that an amazing work would surely take place in Chicago as well. But I could not imagine at all how it would be done. Around that time, I heard that some of the L.A. Church members visited Korea, and I felt a shiver of amazement. The prophecy which had remained unfulfilled for thousands of years was finally fulfilled! We, the members of the Chicago Church, also firmly resolved to quickly find many brothers and sisters so that they would visit Korea as well. 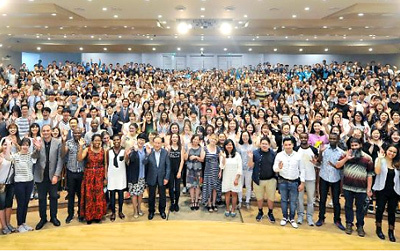 I was so overwhelmed to see the results of the gospel four years after we began to cultivate the gospel field; some of the members finally visited Korea. At that time, only about 20 members from all over the U.S. visited Korea each time, and the schedule and programs were not systematically organized. However, it was very touching and amazing just to see the members fulfilling the prophecy of the Bible with my own eyes. On the other hand, I was also pretty worried if they would make mistakes during their stay in Korea, because some of them were still following a free and individualistic way of life, like most other Americans. However, Mother respected every aspect of their lives and embraced them all with a broad mind like the sea, while I just used to think according to my own standards, ‘They need to correct these aspects, and they have to change those aspects.’ She Herself showed an example of love by sacrificing Herself for Her children and serving them with much care and concern. The members who experienced Mother’s love grew to be good gospel workers. They led their families and neighbors to Zion with the love they had received from Mother, and those who received the truth came to meet Mother and had an even greater faith. Like that, the temple which seemed so big and empty was quickly filled with many brothers and sisters. The members of the Chicago Church always prepare themselves to share the food of God’s word, so that they can achieve their goal for the gospel with one mind. _ You said that the members grew very strong in faith after meeting Mother. How do you think Mother’s love worked within their souls? 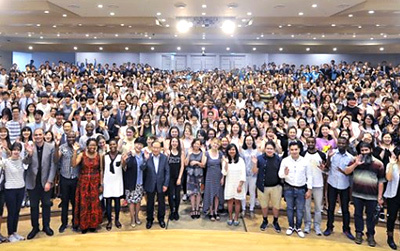 “Every time I join the visiting group, I realize this same thing: For brothers and sisters from America, visiting Korea does not just mean learning something special that they have not learned in America or participating in particular programs. They study the Bible, practice preaching the sermons, and attend worship services, just like they do in the States. Their schedule in Korea is so tight that I sometimes even wonder if they can have time to learn or realize something. The members focus only on Mother. Besides taking care of the visiting group, Mother has so many other things to do. Despite Her extremely busy schedule, She takes great care of each and every one of Her children who visit Korea, without neglecting even a single soul, and She always looks after them, worrying about if they are sick, if they feel any inconvenience, and if they have problem with food. Regardless of how many members visit Korea—10 members or hundreds of members, She takes good care of each and every single member. Her love and sacrifice have never changed from the beginning. The members, who have just literally understood that Heavenly Mother is the source of our life, engrave everything about Mother deep in their souls, being greatly moved by Her every word and touch full of love, during their stay in Korea. The love they receive from Mother becomes the foundation of their faith that is strong enough to keep them from falling no matter what kind of hardship comes their way. _ There must have been a lot of difficulties until the gospel of the new covenant has taken root in America, which is a Christian nation. “A lot of cities in the US have developed from the communities of people who believe in many different kinds of Christian denominations such as Fundamentalism and Evangelism. Especially people in the central region of the USA, which Chicago is located in, are very religious. For us, however, this was not a problem at all. Of course, many people just passed us by when we preached the Sabbath or the Passover to them, saying that they already knew about it; actually, most people have some knowledge of the Bible because they have learned the Bible since their childhood days. However, when we preached to them about ‘Heavenly Mother,’ they all showed interest, saying that they had never heard about it before. The outward problems caused by different ways of thinking and language barriers were solved naturally as time passed by. The real problem was my weak faith. ‘The gospel work in the States is different from the one in Korea.’ This was one of the conclusions I reached after preaching in Los Angeles for three years. It was because no matter how diligently I went door-to-door to preach the gospel like I did in Korea, I did not obtain good results. After going to Chicago, I tried various methods, doing this way and that way, but the result was the same. When I was worrying about what to do, the General Pastor visited the States. At that time, he said, ‘Let’s do it by following the example of Father and Mother, instead of thinking that we can’t.’ Father and Mother visited each and every one of Their children to teach them the words of truth. So, I tried the method of preaching again, which I had early given up on, thinking it wasn’t effective in the USA. Then to my surprise, our heavenly family members began to be found. _ I’ve heard that brothers and sisters in Chicago are very passionate about preaching in other regions as well. This must also be an act of following God’s example, right? “That’s right. Preaching the gospel was what God our Father did all His life on earth when He came in the flesh. He spared no pain or effort to save a soul, climbing up the mountains and crossing the rivers, and willingly did even hard labor for us. So, the members believe that following in the footsteps of Father is their duty as His children. With this kind of mindset, they preach the gospel. Most people think that Americans must be living an affluent and comfortable life because the United States is a developed country. In reality, however, there are not many Americans who live such a wealthy and easy life. Most people are so busy trying to make a living. It is the same with our brothers and sisters in Chicago. Many of them work all day long from the early morning until evening, and some even handle one or two more jobs. They don’t usually have enough time to take a rest. Whenever I see them, I feel sorry for them. Despite all their busy schedules, they preach the gospel every day without sparing themselves, and they often take time off from work to go on a short-term mission trip. The city we first went to plant the gospel was Houston. It takes a full 24 hours by car from Chicago to Houston. The drive time alone takes over two days. So, when we went on a short-term mission trip there, we didn’t have much time to preach. However, as we put our minds and strength together to preach the gospel, many souls were found and Zion was established very quickly, just as the strong walls of Jericho collapsed when the Israelites shouted together with one voice. We laid the foundation of the gospel in some other cities too, including Columbus and Indianapolis as well as Charlotte located in North Carolina—about 16 hours away from Chicago. The members from all age groups of the Chicago Church—male adults, female adults, and young adults—continue to gather together and study the truth diligently. _ I can imagine how the gospel work in the USA will be completed. What is your future vision or plan for the gospel in Chicago? “When the Chicago Church was established, I put up a map of the entire USA on the wall in the office, and I marked the cities on the map in red, where we were planning to establish Zion. Every day I looked at the map and reaffirmed my resolution, but I was also kind of worried about when we would be able to preach the gospel in all those places. But my worry has turned out to be unnecessary. The gospel has already been preached to all the cities I marked at that time, and now Zion has been established in almost all states in the United States. With Zion as a center for preaching, the gospel is being preached quickly to its neighboring regions as well. The ‘Love Belt,’ which is even greater and stronger than the Bible Belt (an area in the southeastern and south-central United States where there is a strong Christian influence), connects a Zion to another. We’ve planned to establish Zion in all 50 states, and it’s not just a vague, distant dream anymore. That is our future which will soon become reality! Our goal for the gospel in Chicago is to establish 20 branch Churches this year. To achieve this goal, we need many more gospel workers. I believe that if we are ready to give the food of God’s word to as many people as possible, God will lead even more souls to salvation and establish Zion for them to gather. So we are working harder to train gospel workers. All the members are devoting themselves to studying the truth, and especially the young adult members are so passionate. Not long after the interview, we heard some glad news from Chicago: The Chicago Church was introduced on a local TV show. This is how the Church was broadcast on TV. One day, while the young adult members were preaching, they met a TV reporter. She showed interest in the truth about God the Mother, and later she called us to ask if it was okay to broadcast about God the Mother and the Church of God on a TV program for “Mother’s Day” (the second Sunday in May). Then she said she wanted to visit us, and on the appointment day she came to Zion. She interviewed us and carefully looked around the Church for a detailed coverage of the scene of our worship service and the truth of the new covenant. 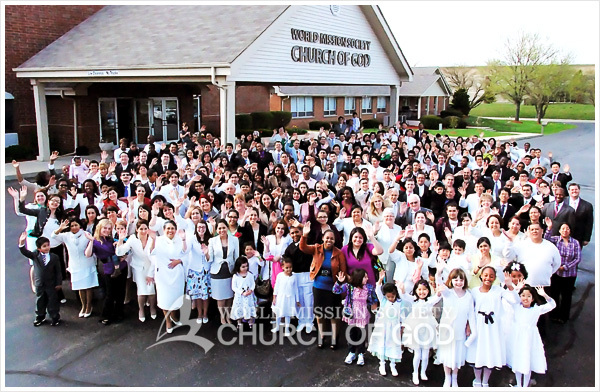 A few days later, our Church was broadcast twice on an evening news show, with the title: “The Church That Believes in God the Mother.” The truth about Heavenly Mother was proclaimed so rapidly throughout the state of Illinois! I can’t wait to see how amazingly the gospel work is going to be spread out in Chicago from now on.